Yet another easy recipe that doesn’t take too long. Emma, who now lives in Papua New Guinea, suggested it to me the other day as it’s one that she makes frequently. It has a slight Asian feel and can have quite a hot spicy taste to it. We made it because I’d bought free-range chicken breasts from Karapiro Meats not thinking what I was going to do with them as I don’t usually buy them although I’ve now changed my mind. Marinate the chicken slices in a bowl containing 1tbsp fish sauce, salt and pepper and 1 tsp sugar. 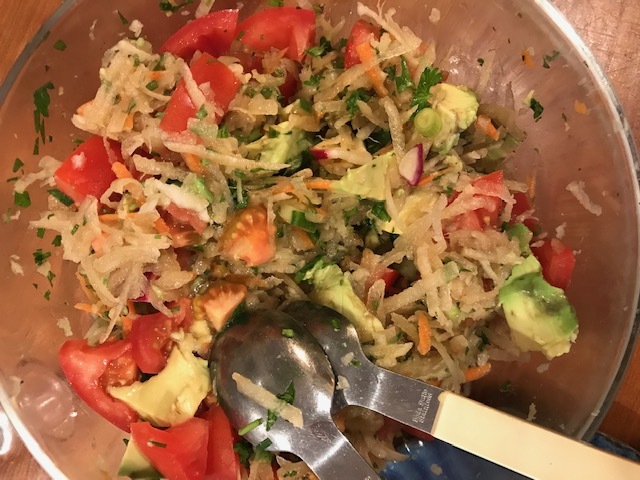 Using a food processor or hand blender make a paste using the lemongrass, shallots, garlic, chilli and coriander and parsley stalks. Heat the oil in a wok or a large frying pan. Add the spice paste and watch it, stirring occasionally until it smells cooked. Add the chicken slices and the marinade, mix it up and fry till the chicken is nearly cooked. Add 1tbsp fish sauce and 1 tsp sugar. Decide if you’ve added enough salt & pepper and adjust if necessary. Then add ½ cup water or chicken stock and cover it all up for 5-10 minutes. Uncover and cook quickly until the liquid is a thick sauce and chicken tender. 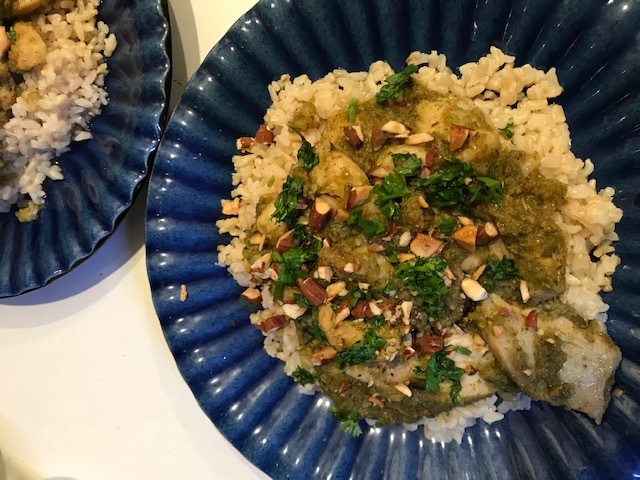 Serve on rice with the chopped nuts and chopped coriander and/or parsley on top. Because this was a little spicy and because I’d bought lots of vegetables from stallholders I made a quick and refreshing salad to go with the chicken dish. The quantities for each ingredient don’t matter – just put in more of the items you particularly like. I made a large lot and had some left so added a few other things the next day. 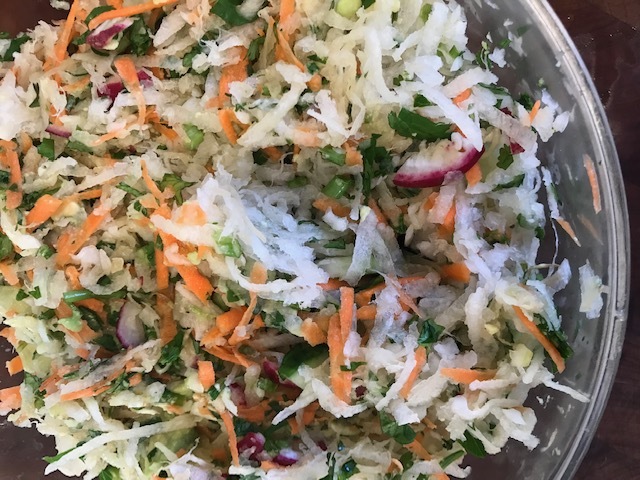 The first day’s salad was a mix of grated daikon, a grated carrot, finely sliced radishes, a piece of slice cucumber, 2 chopped spring onions, a chopped avocado and plenty of chopped coriander. On the second day I added a grated peeled yacon and lots of chopped tomato. Both times I dressed it with a mix of olive oil, lemon juice, Dijon mustard and salt & pepper. We loved both versions as they were very refreshing and quite juicy because of both the daikon and yacon.